Clinical Psychologist Polly Young-Eisendrath says today’s children are being raised to think every one of them is special – a winner with the potential to be great. And she says that’s actually causing more harm than good. 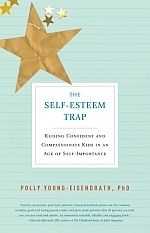 In her new book, "The Self-Esteem Trap: Raising Confident and Compassionate Kids in an Age of Self-Importance", Young-Eisendrath describes "the freedom of being ordinary" and prescribes a new approach to raising children. Singer Lisa Piccirillo first visited Vermont when she was going to college in Saratoga Springs. She says she immediately felt at home and knew she wanted to move here. Last February she did just that. This spring Lisa toured, often working with Vermont singer/songwriter Gregory Douglass. Lisa Piccirillo stopped by the VPR studios earlier this summer to play a couple of her songs from her debut album, Momentum. Singer Lisa Picirillo visits Vermont Edition to sing two songs from her new album Momentum. We look into a community group that’s behind the push for four Chittenden county police departments to track the race of motorists they stop for traffic violations. Also, a live performance from Vermont singer songwriter Lisa Piccirillo.